The new moon of Thursday, February 3, was the second new moon after the winter solstice and therefore marked the Chinese New Year, beginning the Year of the Rabbit. The full moon of Friday morning, February 18, just followed the fifteenth day of the first Chinese lunar month, which is known as the Lantern Festival. The start of this year, then, is an ideal time to look at the features on the moon and see if you can find the “moon rabbit.” Of course, there is no rabbit in the moon, just dark splotches which some people believe look like a rabbit. Understanding the rabbit in the moon, then, involves understanding why the moon has dark and light features. Oceanus Procellarum is the large mare in the center and upper left of this image. The moon is not of uniform brightness because it is not of uniform elevation. The brighter regions are called highlands because they are higher than the darker regions. 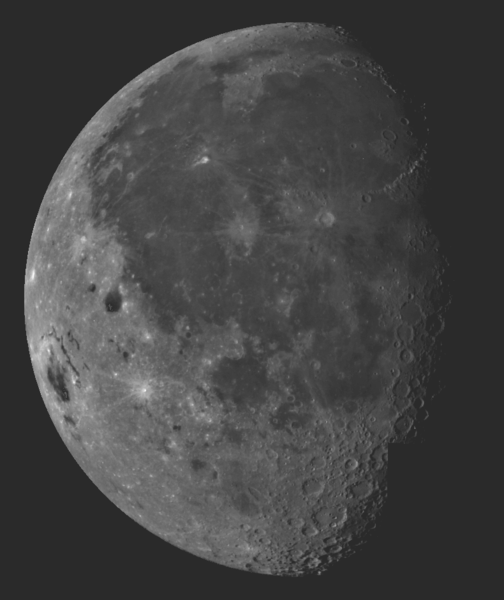 Because early lunar observers mistook these dark areas for earthly seas, they are called maria (singular mare; pronounced ‘mah-ree-a’ and ‘mah-ray’), from the Latin word for ‘sea.’ One mare which is much larger than the others has the name ‘Oceanus Procellarum,’ as an ocean is bigger than a mere sea. Similar, smaller features bear the names lacus (‘lake’) or sinus (‘bay’). These terms have persisted long after we realized that the Moon has no liquid water and no oceans, seas or lakes. Lunar mare are in fact ancient basaltic lava flows which filled basins of very large caters on the moon. Evidence based on radiometric dating indicates that the maria formed between 3.15 and 4.2 billion years ago, with most of the lava flows occurring between 3.15 and 3.8 billion years ago. This would mean their formation followed the Late Heavy Bombardment (4.1 to 3.8 billion years ago), when countless planetesimals collided with the inner planets of our solar system, forming many craters. It appears that during this period, some of the larger impacts fractured the lunar regolith. A few million years later, basaltic lava flowed into the resulting basins. Why do all the moon’s maria face Earth? The maria are not spread evenly across the moon’s surface, but instead are almost all on the near side of the moon, which always faces Earth. The reason for this is a topic of active debate and research among lunar scientists. 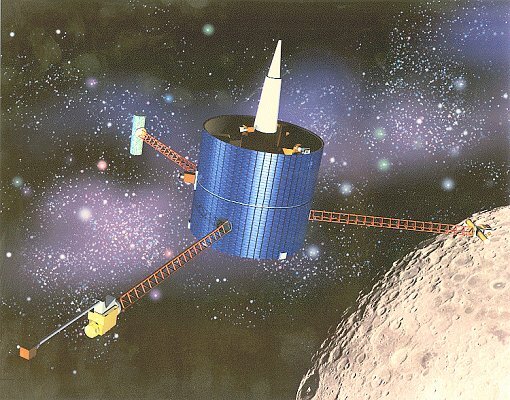 Data from the Lunar Prospector mission indicates that under the lunar crust is a layer abnormally high in potassium (K), phosphorous (P), and rare earth elements (REE). Further, this KREEP material is not spread evenly across the moon but is instead concentrated on the near side, specifically in the Oceanus Procellarum and Mare Imbrium basins. As potassium and the rare earth elements uranium and thorium are heat-producing, their presence may have favored basaltic lava flows on the near side as opposed to the far side. The mare names we use today go back to Italian Jesuit astronomers Giovanni Battista Riccioli and Francesco Maria Grimaldi. In 1651, Grimaldi prepared a map of the moon which Riccoli published in his Almagestum Novum. Folklore associating the first quarter moon with calm weather and the last quarter moon with storms influenced Riccoli as he named the features Grimaldi had drawn. The western limb of the moon, visible at first quarter, has seas of Tranquility, Serenity and Fertility (Fecunditatis). The eastern limb of the moon, visible at last quarter, has seas of Rain (Imbrium), Clouds (Nubium) and Moisture (Humorum), as well as an Ocean of Storms (Oceanus Procellarum). Riccoli was not the first to name features on the moon; Michael van Langren and Johannes Hevelius had used different sets of names. However, when later lunar mapmakers, such as Johann Schröter, used Riccoli’s names, they became standard. Incidentally, Riccoli also labeled the lunar highlands as terrae (‘lands’), but that nomenclature has not continued to this day. Many people around the world have tended to make various pictures out of the darker regions on the Moon’s surface. The scientific term for our tendency to imagine familiar figures on the moon, or in clouds, on trees, etc., is pareidolia. Perhaps you are familiar with the man in the moon. His face consists of Mare Imbrium and Mare Serenitatis (eyes) along with Mare Nubium (mouth). 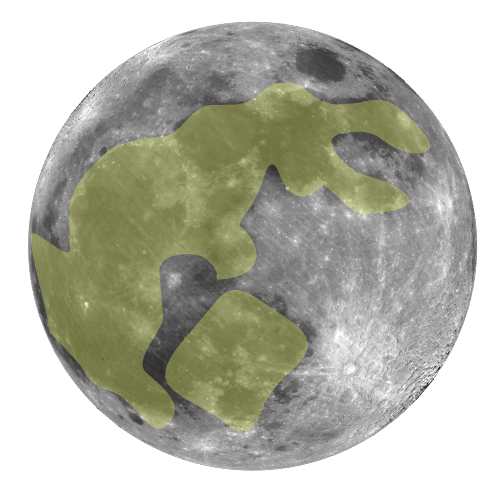 The Chinese, however, imagined a rabbit in the moon. Mare Nectaris and Mare Fecunditatis form the tips of the rabbit’s ears, which come together at Mare Tranquillitatis. Mare Serenitatis marks his head. The large maria Oceanus Procellarum and Mare Imbrium form the bulk of his body, with Mare Vaopurm as his forelegs and Mare Nubium and Mare Humorum as his hind legs. 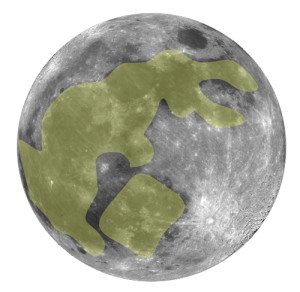 In an alternate image, the rabbit is facing the east (left) limb of the moon and is running instead of sitting. In this view, the head becomes Oceanus Procellarum and the main part of the body Mare Imbrium. The ears of the previous rabbit, mare Fecunditatis and Mare Nectaris, become the hind legs of this one. Mare Nubium and Mare Humorun are now forelegs. Mare Frigoris, a long ‘sea’ near the northern limb of the moon which did not figure into the previous rabbit, becomes a long ear of this one. The rabbit stands by a cooking pot. image:Luna_nearside.jpg and information on the web. In Chinese folkore, this is the Jade Rabbit, making the elixir of life for the goddess of the moon Chang’e. In Japan and Korea, the moon rabbit makes rice cakes. A Buddhist legend tells that the monkey, otter, jackal, and rabbit resolved to offer food to a stranger passing through the forest on the night of the full moon. The rabbit, able to gather nothing but the grass he ate, offered his own body instead, and was rewarded by being placed in the moon. Asian societies were not alone in imagining a rabbit in the moon. In Aztec legend the god Tecciztecatl became the moon god after he hesitated to sacrifice himself in fire to become the sun god. As punishment, the gods decided the moon would not be as bright as the sun. The Maya also associated a rabbit with their moon goddess. Today, our Easter holiday is associated with bunnies. That holiday bears a pre-Christian name which the Venerable Bede attributed to a goddess Eostre, who was associated with rabbits (among other symbols of life and fertility). Perhaps finding the rabbit in the full moons of March and April can put you in the spirit of the Easter holiday.